No need to keep your fellow commuters guessing if that fluff around your neck is faux or real. Cleo Ferin Mercury’s detachable collars are completely fur-free. Ethically handmade in England from 100 percent silk twill, the London designer’s purr-worthy “Hibernate With Me” collection features three jabot styles (hedgehog, badger, arctic fox) that will never be confused with their crueler counterparts. Accessorize your favorite tee or frock with these whimsical statement pieces and give folks something to really talk about. No need to keep your fellow commuters guessing if that fluff around your neck is faux or real. Cleo Ferin Mercury's detachable collars are completely fur-free. 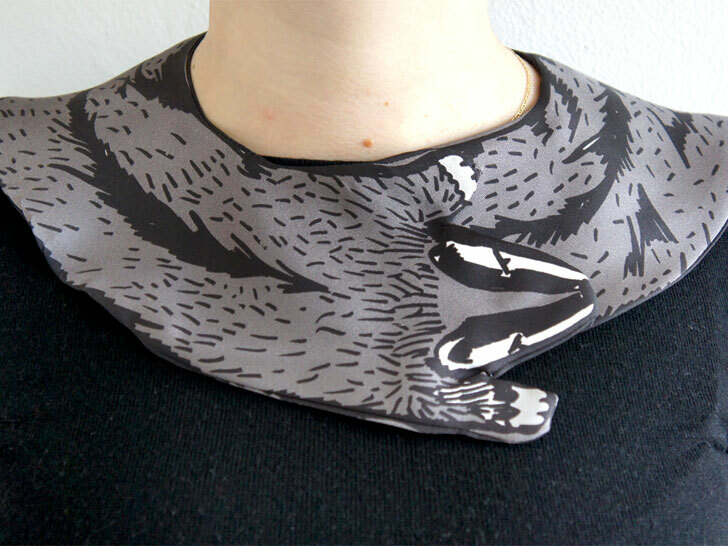 Ethically handmade in England from 100 percent silk twill, the London designer's purr-worthy "Hibernate With Me" collection features three jabot styles (hedgehog, badger, arctic fox) that will never be confused with their crueler counterparts.�Accessorize�your favorite tee or frock with these whimsical statement pieces and give folks something to really talk about.